It definitely isn't optimal, I am having trouble finding an effecient creature for that spot. I see most black Pauper decks running Gurmag Angler (often trouble getting to 7 even with Delve), and Gray Merchant of Asphodel (not enough devotion), but those really don't fit the deck well. I've tested out Nantuko Shaman, Golgari Brownscale, Byway Courier - none seem to provide the above-the-curve midrange goodness of Putrid Leech. Hey, great cube! In your introduction, you talked about u/g being weak. 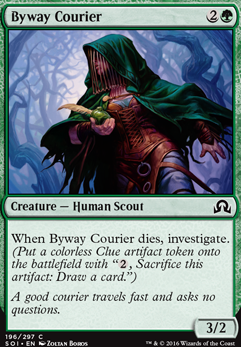 In Shadow over Innistrad and Eldritch Moon the U/G archetype was the "clues" deck with all of the investigate cards.cards such as Daring Sleuth Flip & Briarbridge Patrol, & Byway Courier, also Confirm Suspicions, (I dont like that one, would rather you have Confront the Unknown). Byway Courier is pretty unimpressive. I'd suggest Graf Mole in its place. BubbleMatrix2357 on Mechanize Your Clues, WIN! Good suggestion Aleboth93! I made the swap of Byway Courier for Graf Mole. Cool idea Ghosty, I hadn't even seen Lifecraft Awakening yet! Aleboth93 on Mechanize Your Clues, WIN! Graf Mole instead of Byway Courier, the lifegain can save your game! :)By the way, the deck looks good, it can be funny to play it! Thanks for the help. When I saw the spoiler for Rogue Refiner I knew that it was going to replace the Byway Couriers. Tbh I completely forgot about Aether Hub. 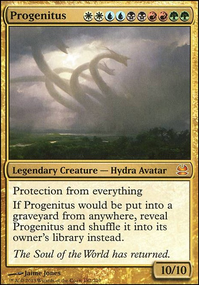 I suggest adding Rogue Refiner from Aether Revolt, he's an uncommon. He could replace Byway Courier. 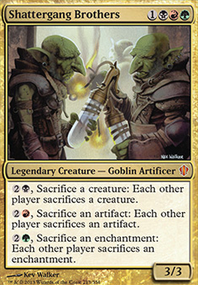 A 3/2 that draws a card and gives you right away is better than Courier who doesn't give you value right away. Consider cutting out the investigate and +1/+1 counters strategy and focus on just energy using Era of Innovation as your draw payoff and Architect of the Untamed as your other energy payoff. Aether Revolt has Peema Aether-Seer and Shielded Aether Thief. They aren't in the database here yet, but I suggest you add them when they are. Aether-Seer is a 4 drop who gives you energy equal the highest power of creatures you control. You get no matter what because she's a 3/2. Aether Thief is a 0/4, but he has flash and whenever he blocks you get . He also has a great ability of ,: Draw a card, which is very good. I also suggest you add Aether Hub they're a little pricey, but very much worth it for any energy strategy. I would also cut 2x Forest for 2x more Woodland Stream.